Despite winning an Academy Award for A Beautiful Mind , Hollywood really needs to stop giving Akiva Goldsman work. 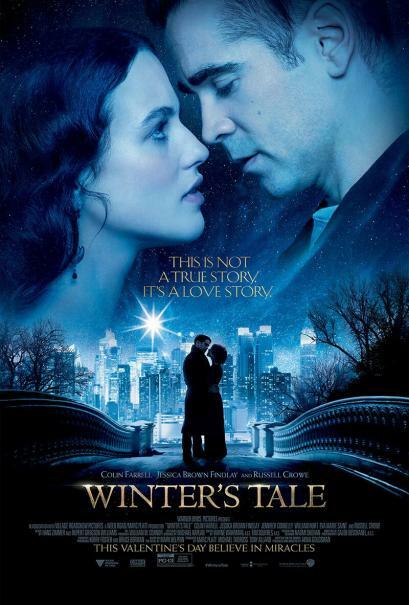 As a writer, he’s made a botch job of some good projects and now, as the writer/director of Winter’s Tale, he’s made a botch of what I can only assume was a fairy tale like novel of the same name by Mark Helprin . Now, to be fair, I’ve never read the original source material so I don’t know how much it veered or how faithful it was but I can say that either way, Goldsman delivered a film which won’t please many people. The biggest problem, to my mind, is that Goldsman is not a good director. Regardless of what you feel about him as a writer (and we’ll get to that soon enough), as a director he is ham-fisted and doesn’t understand the underlying premise of his material at all. He’s supposed to be presenting us with a romantic fantasy, a (the poster says) “love story” complete with epic battles between good and evil, treatises on the nature of love and, in the end, well, love. Goldsman, on the other hand, gives us a hodge-podge of a film with no clear reason for anything to happen, a “love story” with not even a Disney modicum of believability and fantasy elements which, when they do come, come off as laughable instead of majestic. We should be rooting for our heroes to get away from the bad guys, instead of hoping they fall to their deaths. He separates the “reality” from the “fantasy” in such a way that we get no sense of time or place in either world. Sure, we can place the blame for a lot of that at the feet of the screenwriter, but since that’s also Goldsman we don’t have far to go. As for working with actors, Goldsman has assembled an amazing cast. He’s got Colin Farrell, Russell Crowe, William Hurt and Jennifer Connelly… not to mention Jessica Brown Findlay, Eva Marie Saint and even Graham Greene in a throwaway role. And all of them with the exception of Farrell are not only wasted, but bad. Crowe plays a demon who hates Farrell’s protagonist Peter Lake for a reason which I’m sure is explained in the book, but instead comes off as petty and inconsequential. See, it seems that Lake’s parents were turned back at Ellis Island for being sick and so they put their infant boy into a model ship, moses like, and sent him off to a better life – Unfortunately, there’s not a lot of power in this story as even Lake doesn’t believe in the tale. We believe it because we see it happen but who knows if this is a real event or a manufactured version of reality. In any event, Lake is taken in by the people on the coast and then sent to New York City when he’s of a certain age in order to make his way and there he gets caught up with Crowe’s antagonist Pearly Soames. So maybe, when the film gets going (after that setting him adrift scene) and we see the 21 year old Lake running away from Soames, we’re meant to believe he’s offended the older crime boss, or maybe he’s disappointed Soames by not being the “son” he always wanted. No matter, really, because the young Lake escapes with the aid of a magic horse which just suddenly appears. Okay, fairy tale elements coming in, a bit of magical realism, fine so far. When Soames actually lets his true colors show in a public restaurant, though, and we see him become the supernatural demon, I begin to question the whole shebang. Then we find out that Lake is about to use his one miracle (we’ve heard, through voice over narration, that everyone gets one miracle to help another person at some point in their lives) and Soames can’t have that. Soames even goes to his boss, Lucifer (yes, THAT Lucifer) played with alarming casualness by Will Smith (yes, THAT Will Smith) to get special dispensation to take care of Lake. Seems Lake is going to use that miracle to save Beverly Penn, whom he meets randomly, falls in love with for no reason and who also happens to be dying of consumption. Yay! Of course, the path of true love never runs smoothly (and when one of the members is dying, that’s doubly so) so Soames stops the miracle, the girl dies, then, for good measure, he kills Lake as well – revenge accomplished miracle stopped. The final third of the film, however, makes the inconsistencies and absurdities of the first two thirds seem like Shakespeare by comparison. Lake wakes up nearly 100 years after Soames threw him off a bridge with no memory of anything. Of course, Soames is still around, as is the horse, and it turns out Lake needs to save someone else entirely. Connelly shows up here as a young mother who inexplicably falls for the strange amnesiac and, even more inexplicably, entrusts her cancer-ridden child to said stranger. The script here is so riddled with holes it’s a good thing that’s NOT what Lake was set adrift on to begin with, otherwise this film would have been a whole lot shorter. Then again, that may not have been such a bad idea. To sum up… when you’re deciding how to spend your movie going dollars (and increasingly that’s becoming a much more important decision as costs continue to rise) choose something else. There’s a better love story and more believable performances in The Lego Movie, just as an example.